Babies and toddlers are little sponges. As part of their amazing brain capabilities, they have great memories. Xander is always surprising me by remembering things that I never would have imagined he even paid attention to in the first place. I have decided I want to help him develop and retain him memory skills, so we are starting to do some memory games. I was inspired by the games presented in Babylicious, but decided to make my own to make it more engaging for Xander. Right now, we are starting very simple. Basically I am showing him a 2x2 grid of images for 5-10 seconds. Then I take it away and give him a blank grid and separate images for him to put in their "spots." 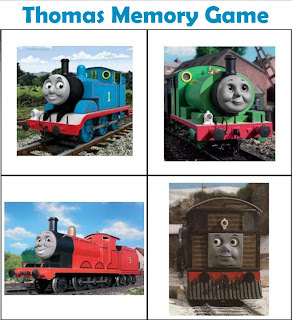 For now, I am only giving him the four images that were in the original grid, but may eventually give him extra images so he has to determine the correct ones. I could also increase the size of the grids or add complexity to the background in the future. While it is taking him a little while to catch on to the concept, he absolutely loves playing. He would play many times in a row if I let him. You can download the game grids I made by clicking the pictures below. Awesome idea!!! 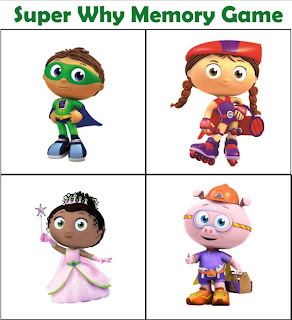 I am working on memory games with my 3.5 year old right now but have just barely started so I'm going to do this with her! We LOVE Super Why and Thomas at my house! Thanks for sharing. I would like to invite you to add this, and more of your great posts, to my weekly Mom's library Link-Up. Great games! I LOVE the name of your blog. Thanks for sharing with The Sunday Showcase.